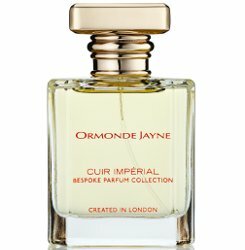 British niche line Ormonde Jayne has launched Cuir Impérial, a new fragrance. The history of leather and perfume are entwined in the town of Grasse in France, which was famous only for the finest leather goods. Ormonde Jayne's newest scent, Cuir Impérial completes a full circle as Grasse today is known for its perfumes of sophistication and individuality. The fragrance of leather comes from treating raw hides with birch tar, followed by being submerged into a vigorous boiling process until a rich leather and burnt woody scent is yielded which infuses so excellently with other spices and flowers. Cuir Impérial by Ormonde Jayne is a perfume to be handled with care and discretion, born to blaze, its intoxication fearless. With such rich ingredients, pungent patchouli, creamy sandalwood, heady musk, smouldering incense and seductive leather, Cuir Impérial spins you into a heavenly orbit, trapping you in a powerful web of intricate complexity. Additional notes include cognac oil, clary sage, bergamot, cardamom, pink pepper, orris, raspberry, rose, freesia, tonka bean, cedar and vetiver. Ormonde Jayne Cuir Impérial is exclusive to Harrods in the UK, £195 for 50 ml. I was so excited then I saw “exclusive to Harrods in UK”. Meh. They replied on instagram that the perfumer for this is Linda Pilkington herself! Not Geza Schön like for most of their other fragrances. IIRC, she said she was the perfumer for the early fragrances too, and only admitted it was GS later after it was publicized by Luca Turin. Actually I am a big admirer of Geza Schön and met him twice in Berlin (Escentric Molecules is my first niche love & still remain loyal!) – had a long chat with him about his other creations & he explained the whole detailed story about his collaboration with Ormond Jayne, so beg to differ with you Robin, but really not the case above – Geza said that Linda Pilkington was the Evaluator and owns all the intellectual property of all OJ fragrances, which means she constructed all the pperfumes and GS just effected them. But that is only the early ones and he has nothing to do with any of the recent ones at all. Geza sounded just as keen to set the record straight as the shop manager had that I met at OJ’s boutique a few years ago! Tamsin, to some extent that is just a difference in how we are using terms like “perfumer”, vs “evaluator” or “creative director”. But also did not mean to imply he was involved with the later fragrances. I would assume he was not since the earlier fragrances had some consistency in style and the later ones don’t seem to, to me. I mostly meant that she is almost certainly still using a “perfumer” to “effect” her fragrances somewhere and I don’t know who it is, and she is not likely to publicize it. Really don’t understand why it’s ‘exclusive to Harrods’ when they have their own location in the Royal Arcade, although I must say I thought it might be the beginning of the end for them when they closed their gorgeous shop in Pavilion Road – glad I was wrong about that. Because it makes Harrods happy and convinces them to allot counter space? Yes, of course, Robin, it’s a business decision. I suppose I just hanker after the days when a standalone, independent perfumer’s product could only be bought from a standalone, independent perfumer’s shop…!